While drinking my morning cup of coffee before getting ready to go off to work, I thought I would log into iTelescope.net's remote robotic telescopes for astronomy education and see what the weather was like at New Mexico Skies. Once I logged into Insight Observatory's Launchpad, I noticed there were several telescopes available that we have not tried yet. Telescopes T-11(Planewave 20" CDK) and T-20 (Takahashi FSQ-ED 106mm (0.1 meters). I have been looking forward to trying out T-11, therefore, I wanted to pick a common bright galaxy that I have observed plenty of times before, both visual and imaged. 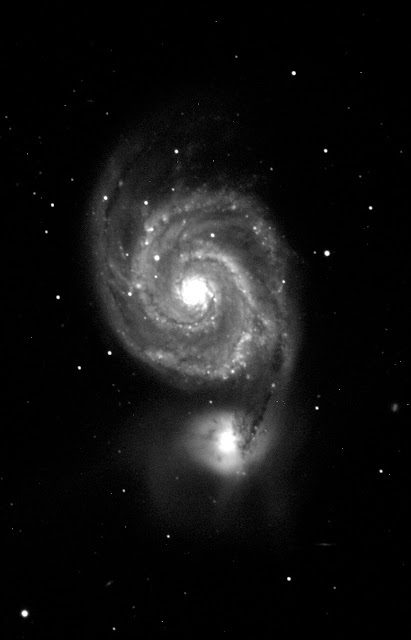 I saw that M51 (The Whirlpool Galaxy) in Canes Venatici was near transit when looking at the "All-Sky Camera". I exposed 1 300 second exposure with the luminance filter only and processed the FITS file in the NASA/ESA FITS Liberator. The image to the left is the result. I am amazed at how much detail I was able to capture with a single 5-minute exposure. I have come to the conclusion that we should use telescope T-11 for examining the details of the galaxy that may be of interest that were originally taken with a wider field telescope such as telescope T-20. Telescope T-20 has a much wider field than T-11 and also has an SBIG ST-8300C One Shot Color CCD camera. After experimenting with the One Shot Color cameras, I am finding that imaging galaxies with them don't show as much detail as the sing images taken with the monochrome cameras. Below is the image was taken this morning with telescope T-20. 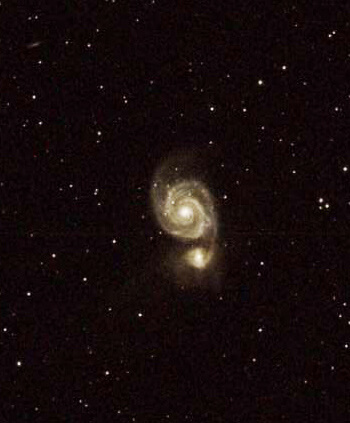 The Whirlpool Galaxy (also known as Messier 51, M51, or NGC 5194) is an interacting grand-design spiral galaxy in the constellation Canes Venatici. Recently it was estimated to be 23.4 million light-years from the Milky Way Galaxy, but different methods yield distances between 15 and 35 million light years. Messier 51 is one of the best-known galaxies in the sky. The galaxy and its companion (NGC 5195) are easily observed by amateur astronomers, and the two galaxies may even be seen with binoculars. The Whirlpool Galaxy is also a popular target for professional astronomers, who study it to further understand galaxy structure (particularly structure associated with the spiral arms) and galaxy interactions.